I love French onion soup. It’s one of those soups that I enjoy more at home than when I am out simply because between the cheese and the onions it can get a little messy. Unfortunately I am not happy unless I am wearing my food! My husband always says I wear it well. 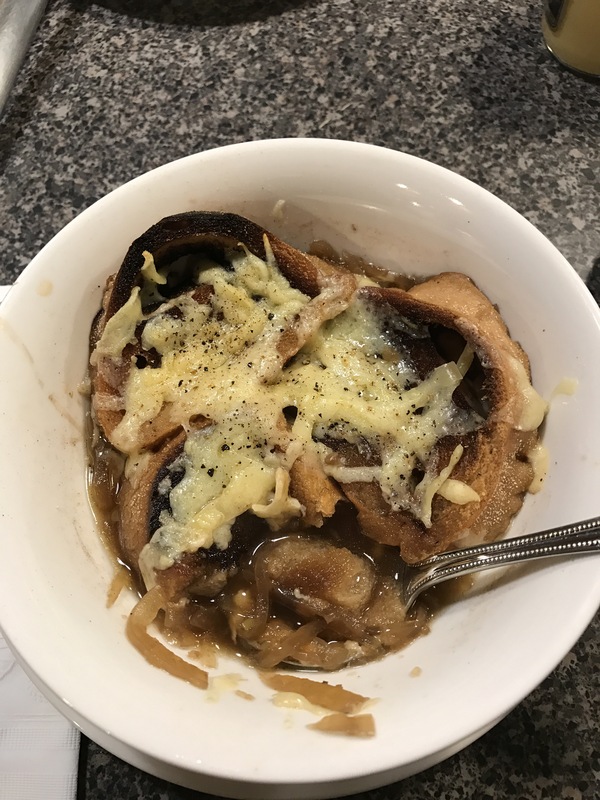 My husband of 20 years informed me he had never had French onion soup. Ludicrous, I said. So I went on a mission to find a recipe that was suitable for Weight Watchers but was also tasty. I came up with the recipe below and guess what? You do all of it in your CrockPot. Super easy and super tasty. By the way, Joseph loved it. So it was a success and will definitely stay in my recipe repertoire. I am told French onion soup freezes well. I will let you know how that goes, since there is a lot of it left. If it freezes well this is a bigger winner than I had planned on. It’s always nice to have soups at hand for those days when nothing but soup and a sammy or salad just hit the spot. Forgive my crouton’s……..I am infamous for burning the bread. Honestly, it was fine! Yours will be perfect. SERVING SIZE 1 CUP (serves 8) 4 WW PP. Set your crockpot to high and add the butter, Worchestershire sauce, balsamic vinegar, minced garlic, brown sugar, and pepper. Cook until the onions begin to caramelize, stirring occasionally. Approx 1-1 1/2 hours. Add the broth, salt, and thyme. Cook on low for 6 hours. Add the Sherry and stir to mix. To serve: Cut slices of french baguette and toast them. In individual oven proof bowls, ladle the soup, place a slice of toasted baguette, and top with 1 oz of Gruyere cheese. Place under the broiler until the cheese is melted and slightly browned. Grate a small amount of Nutmeg on the cheese slices (use caution Nutmeg is powerful.) Serve immediately.